This luxurious-formula eye cream with NouriCel-MD® containing Growth factors, Proteins, Amino Acids, Soluble Collagen, and Antioxidants. It diminishes the appearance of fine lines and wrinkles, enhances skin texture. Also helps reduce the appearance of dark circles and puffiness by removing the hemoglobin degradation byproducts with long term use. INGREDIENTS: Water, Human Fibroblast Conditioned Media, Cetearyl Ethylhexanoate, Dimethicone, Boron Nitride, Polyacrylate 13, Palmitoyl Oligopeptide, Palmitoyl Tetrapeptide-3, Hydroxysuccinimide, Chrysin, Bisabolol, Panthenol, Sodium Hyaluronate, Glycerin, Isoceteth-20, Steareth-20, Polyisobutene, Polysorbate 20, Aminomethyl Propanol, Acrylates/C10-30 Alkyl Acrylate Crosspolymer, Phenoxyethanol, Methylparaben, Propylparaben, Butylparaben, Isobutylparaben, Ethylparaben, Disodium EDTA. SkinMedica is the first brand to use Growth Factors and Proteins on the skin. This product in addition contains 2 Peptides that are proven to reduce wrinkles. Pro-Vitamin B5 helps moisturize skin. 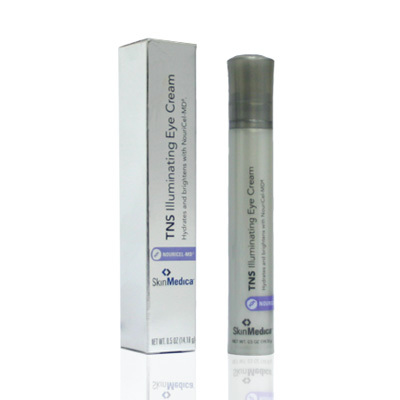 This is a product that is good for lower eye wrinkles. This product contains 2 of the 5 useful peptide products. The Human Growth Factors technology remains unproven scientifically. So far it is proven not harmful, and with its Peptide ingredients, at least this product is good for wrinkles reduction.